Simon Johnson argues that Rio Tinto Alcan NZ (NZ Aluminium Smelters Ltd), the owner of the Tiwai Point aluminium smelter is “Godfathering” the smelter, its workforce, the Southland economy, the NZ electricity market, Meridan Energy and the poor critically endangered slow-breeding kakapo, as well as “Godfathering” the NZ emissions trading scheme to get excessive free allocations of emissions units. Let me introduce a new term to climate change blogging. Godfathering. It’s a bit like Grandfathering, which is a recognised jargon term from emissions trading. But different. Grandfathering in an emissions trading scheme (an ETS), is giving the emission units for free to the existing emitters in the ETS on a historic pro-rata calculation. The number of units given represents the desired cap on emissions1. Of course, our ETS is not so simple. If our ETS just applied simple “grandfathering” as outlined, then it would have a real cap, it would not allow importing of unlimited international units, and it would be impossible for any emitter to receive more units than their emissions. That’s not the case under the NZETS, at least for some emitters. In 2010, NZ Aluminium Smelters Ltd, which is roughly New Zealand’s third largest point source of greenhouse gas emissions, was a net seller of units, not a net payer. Their free allocation of units was 135% more than the units they needed to surrender for their emissions. The justification given for this is that in order to maintain their export competitiveness, NZ Aluminium Smelters Ltd needed to be compensated for the rather unfathomable and diluted ETS costs that may flow through their secret contract with Meridian and the electricity wholesale market. I will come back to this later in the post. Let me update their emissions and allocations for the 2011 year. In 2011, NZ Aluminium Smelter Limited produced 354,030 saleable tonnes of aluminium. The 2011 Ministry of Economic Development Chief Executive’s Report shows that the New Zealand aluminium manufacturing sector (a.k.a. NZ Aluminium Smelter Ltd) reported emissions of 601,370 tonnes CO2-e for the 2011 year. We divide by two for the ‘two tonnes for one unit’ deal, and that results in 300,685 units to surrender. The Ministry for the Environment allocated 437,681 units to NZ Aluminium Smelter Ltd for the 2011 calendar year. That’s 136,996 more units allocated than surrendered or alternatively the units allocated to NZ Aluminium Smelter Ltd exceeded the units surrendered by 146%. So that’s even more excessive than 2010’s 135% over-allocation! How did NZ Aluminium Smelter Ltd/Rio Tinto Alcan NZ Ltd achieve that? Simple really. They threatened to close the smelter and move production offshore if the NZETS really imposed a real carbon price on them. Thats a nice aluminium smelter you got. Be a shame if something happened to it. Now thats what I call “Godfathering”! But wait there is more. In July, Rio Tinto Alcan NZ announced an annual loss. CEO Ryan Cavanagh said the smelter’s financial difficulties were due to falling world aluminium prices. And that they needed to revise their electricity supply contract with Meridian Energy to get input costs down. A day later, the parent company Rio Tinto Alcan indicated what may happen to it’s unprofitable smelters. They will be shut down. No pressure, Meridian Energy! According to Brian Fallow, if the smelter closes, there could be a “seismic” knock-on effect on the electricity market. Supply would exceed demand by the 14% of NZ’s electricity generation used by the smelter. Wholesale electricity prices would react. Some generation assets might be crowded out. Thats a nice wholesale electricity market you got. Be a shame if something happened to it. Brian Fallow notes the Meridian power contract, that the smelter wishes to renegotiate, represents 40% of Meridian’s sales. Closure of the smelter or renegotiation of the contract put the spanner of uncertainty into the Government’s planned partial sale of Meridian and the other generators. Nice plan for partial privatising some state-owned power generators you got. Shame if something happened to it. The closure of the smelter would also have an impact on the local Invercargill and Southland regional economy. Nice regional economy you got. Shame if something happened to it. Next we hear that the smelter is fast-tracking the redundancies of it’s highly-trained and highly-paid workforce. Nice well-trained professional smelter labour force you got. Shame if something happened to it. And Rio Tinto Alcan NZ also wants to withdraw from partly funding the successful Kakapo Recovery Programme. Nice charismatic endangered species programme you got. Shame if something happened to it. That’s a lot of Godfathering! 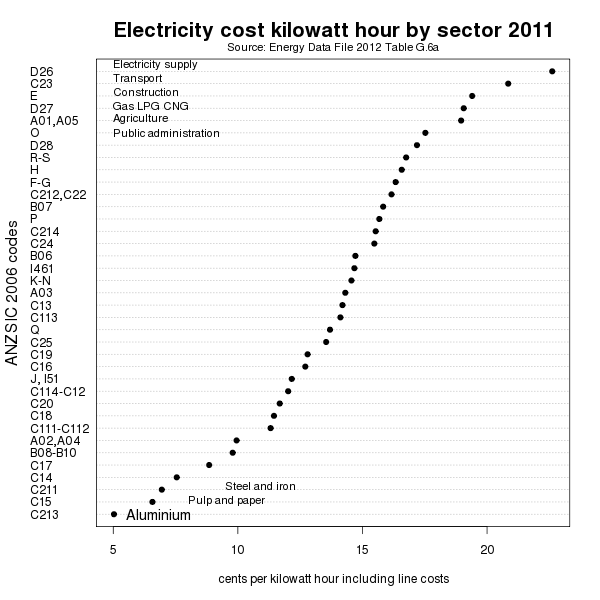 Let’s look at New Zealand Aluminium Smelters’ electricity use and costs in 2011. How much do they use? How much do they pay? Does their power cost justify extra allocations of emissions units? Is it realistic for New Zealand Aluminium Smelters to try to get Meridian to give them cheaper power? Let’s look at some charts of electricity use data from the Energy Data File 2012. The actual data is Spreadsheet G worksheet G.6.a. now at Google Docs. This dotchart is of electricity use data in 2011 by industrial sector from Spreadsheet G worksheet G.6.a.. The chart makes it very clear that the Tiwai Point Smelter is, by a huge margin, the biggest single consumer of electricity in New Zealand. A single company at a single plant used 5.3 million MWh out of 38.8 million MWh consumed in 2011, or 13.67% of the total consumption. Only the combined 4.4 million people in homes (the residential sector) used more, with 13 million MWh or 33% of the total. If we just look at industrial use of electricity, and leave out the residential sector, the smelter uses 20.6% of all electricity used by industry. This chart shows industrial electricity sectors sorted by average rate (including line costs) in cents per kilowatt hour (i.e. its MWh divided by sales $$ times 100). You need to look at the bottom left hand corner, not the top. Thats because Rio Tinto Alcan NZ Ltd/NZ Aluminium Smelter Ltd pays the very lowest average rate for electricity in New Zealand; 5.03 cents! Residential users pay 22.6 cents per KWh, or four times as much. No industry in New Zealand uses more electricity than New Zealand Aluminium Smelters/Rio Tinto Alcan NZ. No industry pays less per unit for electricity than they do. They even get excessively allocated emissions units to help with the lowest priced power contract in New Zealand. And now New Zealand Aluminium Smelters/Rio Tinto Alcan NZ are going for “Godfather” gold by trying to bully their power price even lower. The aluminium industry is very cyclical. The only time that a smelter has “leverage” is at the bottom of the cycle which is now. If they can use the opportunity to reduce costs to break even point at the bottom of the cycle, they can make even more money on the next up swing. They have done it before and will continue to do it if they are competent business people. The additional factors this time round are the unique concurrence of the National led asset sales program and Rio’s plan to sell off most of its Australasian aluminium assets. Rio will push their interests even harder this time. 1. If someone will resign if he does not get an advantage for himself accept his resignation – perhaps welcome him back when he demonstrates an understanding of the issue. Otherwise no deal. So they’re threatening to go offshore… leaving behind a fantastic hydro smelting setup (I toured round it on a visit to NZ.) Let ’em. Nationalise it. In a carbon-free future, hydro spots like this are increasingly going to be global industrial epicentres. Start the feasibility studies for a N fixing plant, for fertiliser not the high explosives the hydro plant was originally proposed for. Kiss of death for any lingering ambitions to dig up lignite for N fixing, and RTZ may conclude that on reflection they quite like this Al smelter and want to stay put. Hydro plants like Tiwai Point are one of the reasons I always reject arguments like: ‘renewables aren’t sustainable because they require non-renewables’. They require some source always able to bootstrap the rest of the renewable economy – things of the scale of Tiwai Point fit the bill. The N example is interesting: if you were selling that power to a diverse range of producers, which ones would be paying highest dollar in a fully renewable future? I’d say that would probably include other renewables like wind turbines (hence ‘bootstrapping’). As an economic geographer, the way the geography of production needs to reshape like this is fascinating / very hard to predict. NZ should be right at the centre of that – though of course, that would bring its own environmental problems. Just to clarify, which “emissions” are you referring to with regard to Aluminium smelting at Tiwai? Is it part of the smelting process, or part of the hydroelectricity used to power the plant? I’ve pointed this out to Mr Feb before, but he ignores it. He’s not including all the emissions, and unsuprisingly concludes overallocation and all manner of conspiracies. In 2007, Tom Campbell, the chief executive of majority owner Rio Tinto Aluminium NZ, said that the smelter was amongst the top 5% of the world’s 250 aluminium smelters in terms of low emissions. In 2007, 1.97 tonnes of carbon dioxide was released for every tonne of aluminium produced. The basic reaction is Al2O3 → 2Al + 3O as in the Hall-Héroult process; if all the oxygen at the red-hot carbon anode becomes carbon monoxide (that subsequently becomes carbon dioxide) then for one tonne of aluminium, 1.55 tonnes of CO would result, becoming 2.4 tonnes of CO2. However if all the oxygen went directly to CO2, then 1.56 tonnes of CO2 would result. At the stated rate of 1.97 tonnes of carbon dioxide per tonne of aluminium, the production of 272,000 tonnes of aluminium in a year would emit 535,000 tonnes of carbon dioxide. Many other compounds are formed, plus particulates: these may be filtered out or simply vented to the atmosphere. That text also doesn’t consider the indirect emissions from electricity use. If the smelter wasn’t using the electricity, there would be less thermal generation and Meridian would enjoy an ETS influenced market price for its generated electricity. The supply agreement between the smelter and M must include some ETS cost to represent the opportunity cost to M. It is that cost increase that the smelter receives an allocation for in addition to its direct emissions. I agree Thomas. ‘What if’ scenarios do not generate GHGs and a massive reduction in GHGs is the only thing that counts. Of course there are opportunity questions – What if Manapouri had been built without an aluminium smelter in prospect? What if we had to get that big chunk of Manapouri power to the national grid? but those potential costs have nothing to do with the smelter’s GHGs. Well then what if someone could come up with a better way of producing aluminium that produced less GHGs or actually managed to sequester them? – that is what a carbon price is supposed to inspire. Does the ETS scheme accomplish that? Is anything being done? Really? I would think that NZ’s location with Manapouri producing the power is perhaps as good as it gets for AL production really. We need AL as it is a light weight yet strong material and probably, if water power is used for electricity generation, less CO2 intensive than steel production. But I could be wrong, don’t have the time to run the numbers. So if they pay their dues for the CO2 emissions they cause in form of buying ETS permits on the market – this is really how it should be done I think – then we could perhaps call NZ’s AL to be one of the more environmentally friendly AL products. However if Rio Tinto works to deconstruct whatever potential the ETS may have as an instrument to reduce CO2 then of cause we are in the mess things seem to be in at the moment. And if every player acts like Rio Tinto and CO2 emissions will not go down then we can pack our proverbial (and in many cases actual) bags and head for the hills….. Yes this is exactly the problem. If we still need Aluminium, then it makes sense to produce it in the most environmentally friendly way possible. If we focus only on our local ETS issues, then we might end up exporting the production to China, for example, where the electricity is generated by coal, and we end up losing a whole lot of jobs in the process. But andyS, you’re missing the point. Rio Tinto are simply attempting to extort a lower price for electricity from the SoE and the woefully inept government of the day – as is their right as a private business. On the other hand, maybe the government isn’t so inept as they seem. After all, if your goal was to minimise the price of a valuable SoE for your friends in the investment business, this would be a pretty smart strategy. Once an investment banker, always an investment banker. Greenhouse gases emitted from aluminium smelting include CO2 and perfluorocarbons (PFCs) and have three sources: consumption of carbon anodes; 84%, production of PFCs; 6% and consumption of heavy fuel oil; 10%.. Source New Zealand Aluminium Smelters Ltd Sustainable Development Report 2010. You are using a strawperson argument. I have not “left out” indirect emissions from the use of electricity. I specifically mention them in the fourth paragraph, where I note that the indirect emissions reflected in the wholesale cost of electricity are the justification for a higher-than-100% of direct GHG emissions allocation. Also I have never used the term “conspiracy”. I would describe NZ Aluminium Smelter Ltd’s actions as rentseeking. However as Brian Fallow says we have no idea of how much extra ETS-related carbon price is reflected in wholesale electricty prices. We also have no idea how much of NZ Aluminium Smelter Ltd’s electricity use is priced at the wholesale price. Brian Fallow thinks 10%. The facts are that the 2012 Energy Data file shows that NZ Aluminium Smelter Ltd had cheaper power per unit than any other sector or industry in NZ. The facts are that NZ Aluminium Smelter Ltd reported GHG emissions for 2011 at a rate of 1.70 tonnes CO2-e per tonne of aluminium production (601,370 tonnes CO2-e / 354,030 tonnes aluminium). NZ Aluminium Smelter Ltd were allocated emissions units at a rate of 2.726 units per tonne of aluminium production under Regulation 7 of the Climate Change (Eligible Industrial Activities) Regulations 2010. The allocation rate (2.726) exceeds the average reported GHGs per tonne of aluminium (1.70) by 1.026 units per tonne or 60%. To me it is highly implausible that the indirect carbon price (reflected in the wholesale electricity price then reflected in what NZ Aluminium Smelter Ltd pays Meridan) could be as much as 60% of the direct production CO2-e emission from smelting aluminium. This rate of allocation is neither reasonably or transparently justified. The allocation rate was approved in this June 2010 Cabinet paper on the basis of usage data supplied by NZ Aluminium Smelter Ltd to the Ministry for the Environment. But of course the detail has been blanked out. I am quite happy to “agree to disagree” with you, but how about you provide your own analysis and number-crunching to support your view that the NZETS should channel large quantities of emissions units to a highly-carbon intensive trans-national, instead of just asserting without any evidence that I am “wrong wrong wrong”. You are wrong to declare over allocation without knowing the amount of units allocated through electricity consumption. You are wrong to compare total allocation with only direct emissions. You are wrong to assert over allocation because you think something is ‘implausible’ without actual facts. Is that the best you can come up? Just saying “You are wrong” three times? The same sort of tax is proposed here, with consequential exemption of SGG importers and manufacturers from the ETS. It won’t affect the smelter though it might use lots of imported SF6 in switchgear. Producing SF6 as a by-product of smelting will stay in the ETS. At least that’s how I understand the amendment bill. An update on the smelter’s ETS costs. They are not costs. Stuff. “Smelter cuts production 15pc” by James Weir, 09/07/2012. Scroll down to the last two paragraphs. Yes the Emissions is a story but the real story on NZAS is that NZ taxpayers subsidise the plant to the tune of about $700m each year and we have done since 1971. In relative terms it was less in the early decades but despite pleading poverty and a loss RTA Pacific (NZ) in 2011 – a related company made an after tax profit of $186.36 million declared.